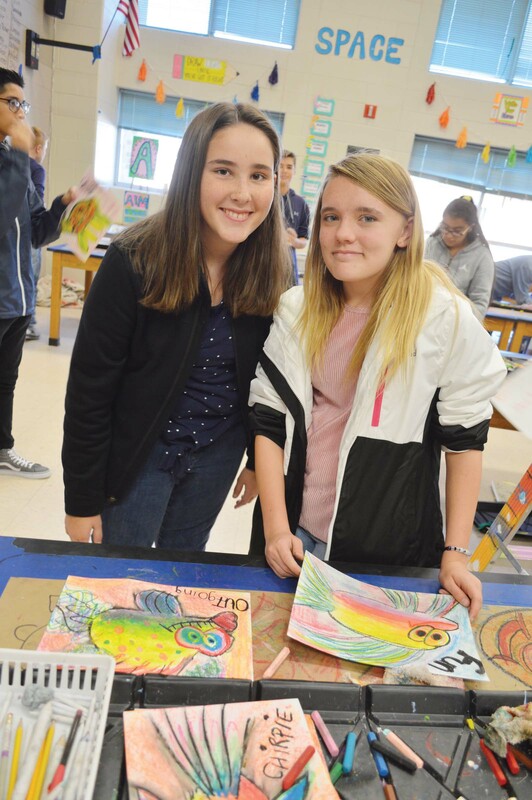 Selbyville Middle School students working on their fish self-portraits lead by artist John Donato. From left, Aniyah Collins and L’Ayriah Drummond. McKenzie Tubbs and Judith Richardson are wrapping up their fishy personas. Summer Long and McKenna Miller working on their self portraits. So students had this alternate outlet: to express themselves as a cartoon fish. Although they weren’t human, the fish showed personality though their fins, eyes and other little details. Each was different. The project teaches trust in the teacher, self-reflection and bravery in expression. They also reviewed art skills, like complementary colors, or tricks to make chalk pastels pop off the page. Within minutes, turtles, jellyfish and starfish began to appear in a rainbow of colors. The finished product will be a stop-motion movie, using footage and photos from the classroom. SMS will unveil the short film at a future pep rally. Normally, the SMS course schedule doesn’t allow every student to take art. 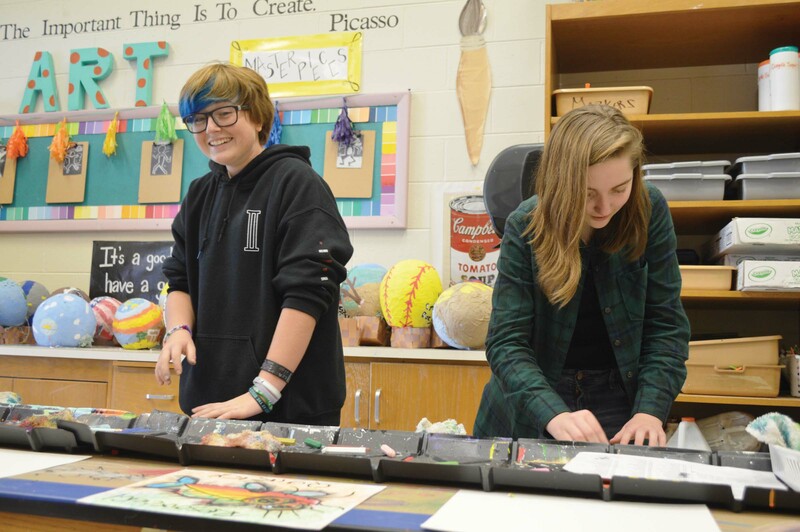 So, teacher Mallory Anderson was thrilled that Moving Pastels is a schoolwide project. The kids are proud of their work and enjoy having their pictures taken. 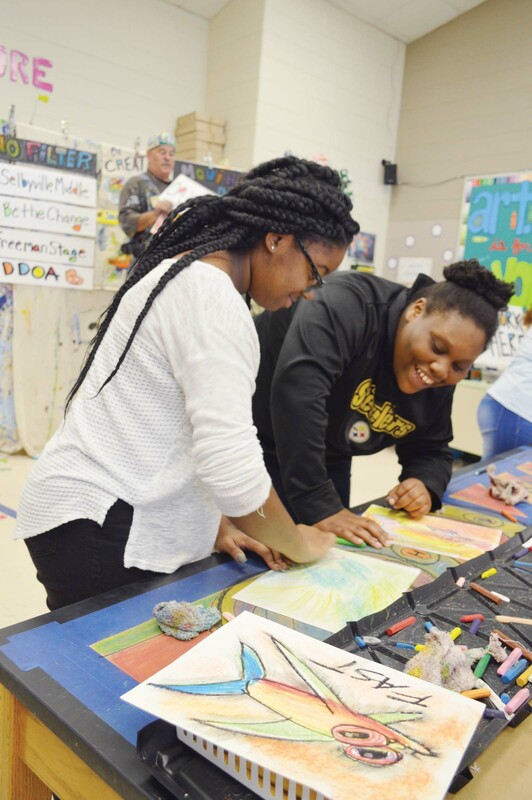 “It’s an awesome experience for every single student to participate in,” especially since some kids haven’t taken art since elementary school, said Anderson, who helped create a special schedule to get everyone in the classroom in late October. Donato reveled in the organized chaos (overseen by local volunteers) that allows students to have fun, but also complete a full art project in 40 minutes. SMS cranked it out in a week, plus one community night, where students taught their own parents to design a fish.